Your donations are 100% tax-deductible! Our Tax EIN is 47-5230463. We are funded only through generous donors like you! We are also a 100% foster program so donations for dog care are always welcomed. We also always need fosters, volunteers and other services for marketing, event setup and so much more! Please consider donating via PayPal - no amount is too small! These funds will cover medical and veterinary care and other expenses. Please consider donating via Paypal with a monthly subscription. These funds are typically used for vaccinations, microchips and other services. ​Please considering ordering items from the WishList - your order will be automatically shipped to us directly! ​Choose "Spirit Canine Rescue" as your charity and Amazon will send us donations quarterly from a portion of your purchases. Just set it up once and then always login at smile.amazon.com. 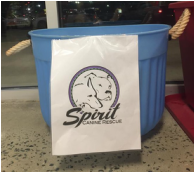 We usually have events in Alamance County where you can bring your donations. Or you can contact us for pickup. Use our personalized landing page, shop for food and pet supplies, and Chewy.com will donate $20 to us! They offer fast and free shipping (orders over $49), autoship for your staple items and at prices cheaper than your local store. ​Order a Kuranda bed for us!